Hi Jason, your BT exchange must have Orange LLU (Local Loop Unbundling) installed for you get Orange up to 20 Mbps broadband speed. Orange LLU 20 Meg. Sync 11290 Kbps. Exchange DSLAM=BDCM=Broadcom. Hi all, im new here so bear with me. "your configured download throughput speed for this service is 2000kbps"
"for your connection the acceptable range of speeds is 400-2000kbps"
"Your DSL connection rate: 8096kbps (downstream), 448kbps (upstream)"
"IP Profile for your line is 2000kbps"
So does that mean my line only supports 2mb, does my router only support 2mb (Orange Livebox) or is my line restricted somehow to only receive 2mb? Whats the "Your DSL connection rate: 8096kbps" mean? Id say it meant the line will support up to 8mb? So why arent I able to get that? One last note, according to BT, the line supports between 5.5 and 12.5mbps. The answer is that the IP profile for your line is at 2000Kbps, this is what is capping your throughput speeds. The 8096Kbps shows the actual sync rate of your router. Since you state that this test was run with your kit connected in the test point of the BT socket, I'd politely suggest you haven't got your set up right when using as you were before. There will be a filter missing off something, a Sky box for instance, or it's just that your extension wiring is dragging the sync rate down. Sync rate will adjust every time the router is powered off (roughly speaking) but the IP profile will require up to 72 hours of stability at an increased sync rate to adjust. If possible, leave your router in the test point for at least 24 hours, then run the www.speedtester.bt.com jobby again. Come back here with the results. I'll wager that your throughput speeds will have increased. Then we can get round the business of sorting out your set up problems. Thanks for the reply, ill give that a try next week and see what happens. Ive had no system change its been the same since it was installed and the speed has always been the same. Its never questioned before as all line tests I did showed up as up to 2mb so I thought i was at the top end. Its only now ive checked. No need to be polite, if im doing something wrong, please tell me. Run one speedtester.bt.com a day. BTW with a 2000 IP Profile, a 2.48 Mbps result from speedtest.net is impossible, i.e. its fudging or confusion due to security software is affecting that result. Have a read of my page about IP Profiles. That explains what is going on, and why the others have asked you to leave it connected to the incoming port for a few days, as requested by Orange. When you say "the incoming port", do you mean the master socket, or do you mean you removed the faceplate and used the test socket, shown on the wall at the back in this pic? 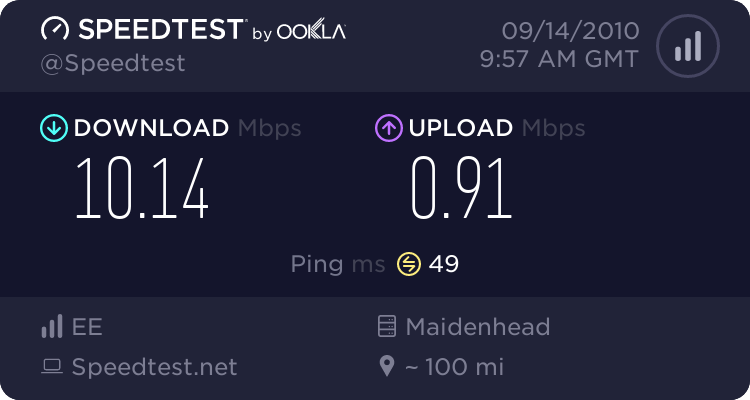 From the BT speed test you posted you have a good line that is connecting at about 8Mbps. We just need to get that to reflect in the throughput . Sync Speed or download speed? Could you have been throttled due to excessive usage? i am having the same probs with orange, every night just past 17.00 i start to lose bandwith, and have recorded as low as 238 kbps, endless phone calls and all the line checks prove nothing, but since sending email to them saying going elsewhere they have replied saying all heavy users are controlled during peek hours,and this has only just started 2 months ago as before this i was on the same speeds 24/7 so i think orange have now got a capping on heavy users. CAN ANYONE TELL ME A DECENT IP IN THE UK ? as unlimited does not mean what it says now ! what exchange are you on? Orange isn't LLU any more, it is resold BT Wholesale. Not even as an ISP in their own right like most that use BT Wholesale. They don't have their own hardware, most do. I asked these Qs over a year ago when Orange was LLU. And you never bothered to answer them anyway. And why not start you own thread, probably under "Which ISP? ", as this has nowt to do with OP?